Since my last post, we had an All Volunteer Conference near Kampala where all the PCVs currently serving in Uganda came together for a couple of days to meet and greet, catch up, and share our stories and ideas. I thought I knew a lot of volunteers here, but it felt like almost half the faces were new to me (we have about 160 PCVs in Uganda). I presented a session on animal husbandry which went well, and we all ate delicious food and enjoyed spending time with one another. 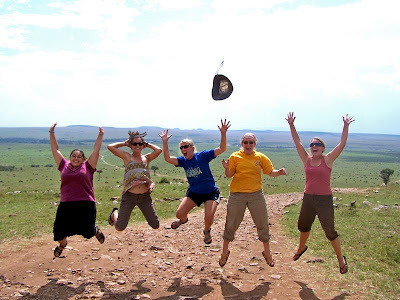 After All Vol, I went with 4 other PCVs from my training group (Becca, Chelsea, Lisa, and Rashida) to KENYA! The trip was absolutely incredible. Nairobi was an impressively-large, much more developed city than Kampala. As we were passing through, I remarked, “Wow, look at all the traffic lights they have!” just as our taxi driver ran a red light. Oh well, nice try Kenya. 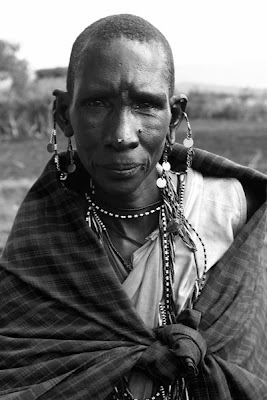 The people seemed much less muzungu-crazed than in Uganda, and we were called ‘muzungu’ only a handful of times – a very nice break for us. We saw many amazing things in Kenya, but our main objective was the Masai Mara National Reserve, which was probably the most amazing safari I’ve ever been on (and I’m privileged to have been on safaris all over East and Southern Africa). On our 4-day safari (with only two full days in the park), we saw 54 lions(! 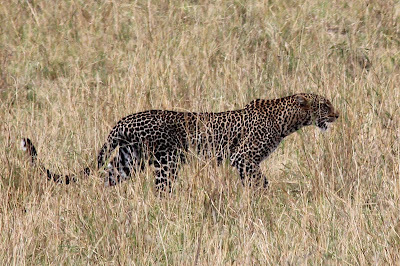 ), 4 cheetahs, a leopard, elephants, giraffes, hyenas, ostriches, and hundreds of zebras. 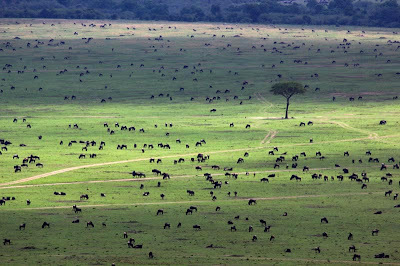 While this was all super impressive, the main reason we chose to go to the Masai Mara at this time of year was to see the wildebeest migration, which is featured in countless Discovery Channel and National Geographic documentaries. 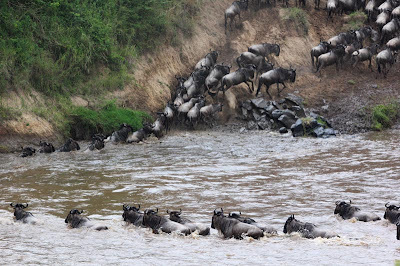 We were SO lucky to not only see the migration, with literally hundreds of thousands of wildebeest stretching up to the horizon, but we also saw them cross the infamous Mara River! After our safari, we had a chance to visit a Maasai village, which was interesting but of course touristy – at least it was a way for us to take unlimited photos without offending anyone. Overall, this was a once in a lifetime experience, and we are so lucky to have seen all that we did. 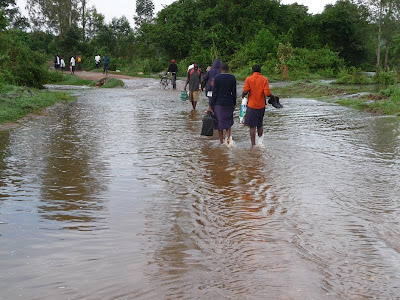 When I came back to site after Kenya, the road into my village was flooded! I thought the taxi drivers had been joking when they said the road was impassable, but when I arrived at dusk, I had to wade through 100+ yards of water that sometimes reached halfway up my thigh (I’m short, but still!). Thankfully my house was nowhere near the danger zone and the water soon receded. The water the next morning, after it had already gone done significantly! I also recently had a chance to help train the newest group of trainees (who will soon swear in to be Peace Corps Volunteers). I talked about malaria prevention and what PCVs in Uganda did to celebrate World Malaria Day and raise awareness in our communities. I’m also coordinating with two local schools to do the World Map Project, through which the students will paint a giant map of the world on a wall of the school. One school is definitely on board, so we should start work next weekend. I’m really excited to get this going, as this is a project I’ve wanted to do since the beginning of service. The goal of the project is not only to increase the students’ knowledge about geography (which is very limited for even educated Ugandans), but to help them with critical thinking, creativity, mathematical methods such as drawing a grid system, and to build confidence by completing a big project that will be a beautiful, permanent fixture of the school. I’ll post photos as our map develops!